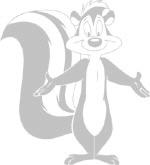 Pepe Le' Pew. The epitome of the romantic Frenchman, confident of his ability to win the hearts of any woman he meets. 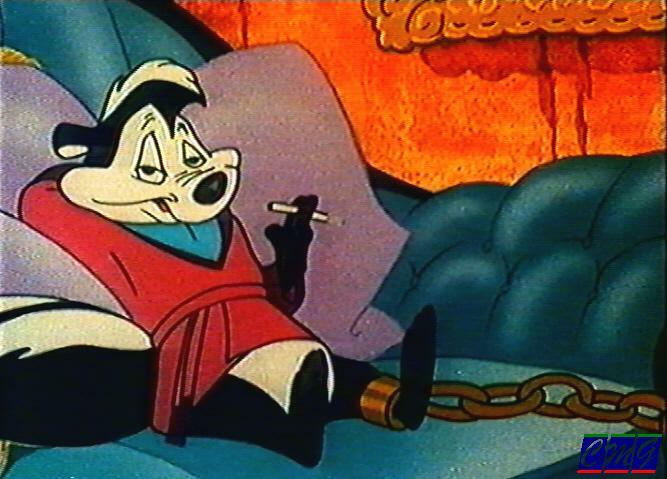 Only problem is - he's a skunk, therefore women avoid him! 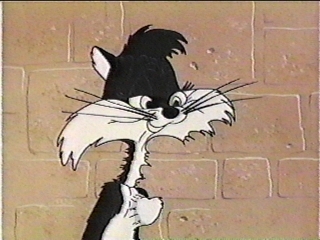 In fact, Chuck Jones appears to have based him on Maurice Chevalier, a French actor. We all know the basic formula - a female black cat gets a white stripe painted on her back, either by accident or by design, or even by the design of others. She attracts Pepe' s attention and he starts wooing what he thinks is a female skunk, only to have her run away all through the picture. 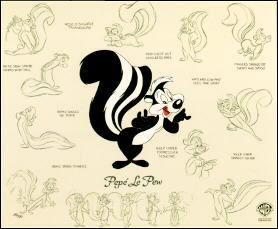 But "Odor-able Kitty," Pepe' s debut, is quite different. 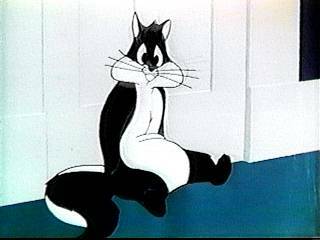 For one thing, the cat is a yellow male tomcat, who disguises himself as a skunk to gain peace from tormentors, only to attract Pepe' s attention. For another thing, Pepe (called Henry here) has a wife and kids! Finally, when the wife and kids arrive, "Henry" suddenly drops his French accent! 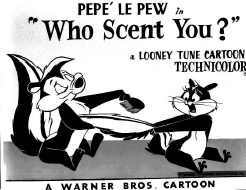 Apparently Pepe was intended to be a one-shot deal, but he was resurrected for "Scent-imental Over You." 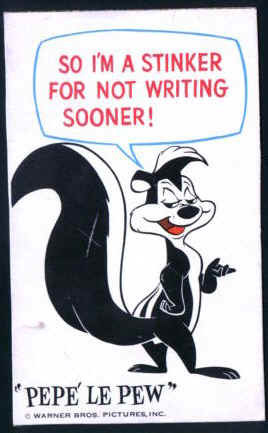 Gone is the wife and kids, and Pepe (apparently called "Stinky") keeps his French accent. 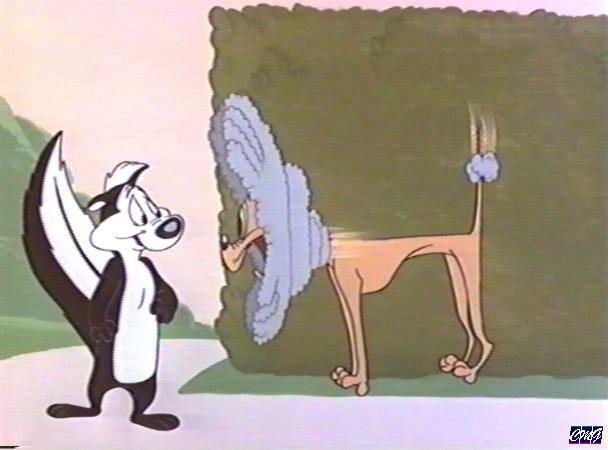 The male tomcat becomes a female Chihuahua who wants a furry coat, and makes a coat for herself -- only it's a skunk coat, and everyone runs away from her, leaving her crying -- and attracting Pepe' s attention. At the end, she reveals herself to be a dog, and Pepe pretends to be a dog as well. 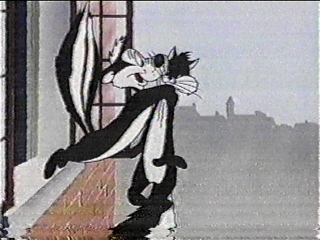 After one more appearance with a male dog in "Odor of the Day", the basic formula debuts in "Scent-imental Romeo". Here, because Pepe is in this perfumer's shop, the perfumer tries to use his cat to chase out Pepe. At the end, the unnamed cat falls into a barrel of bad water, and Pepe falls into a can of blue paint which masks his smell. As a result, the cat falls for him and winds up chasing him! 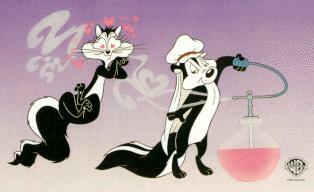 This ending is repeated in "Little Beau Pepe," where the cat's attraction is attributed to Pepe' s using perfumes as an aphrodisiac. 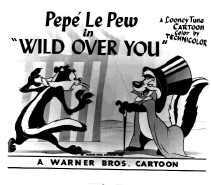 From then on, Pepe chases his beloved cat all over the world, with some minor changes for the most part. 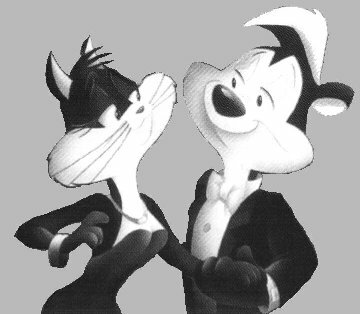 In "Wild Over You," the cat is a chestnut female wildcat who disguises herself as a skunk to avoid returning to the zoo from which she escaped, and attacks Pepe whenever he woos her. 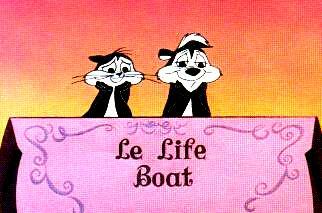 Sometimes the cat is named; in "The Cats Bah," the cat is called Penelope, the name which we normally ascribe to her. 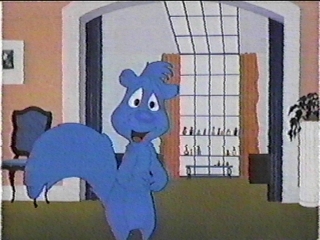 One creative episode was "Really Scent." 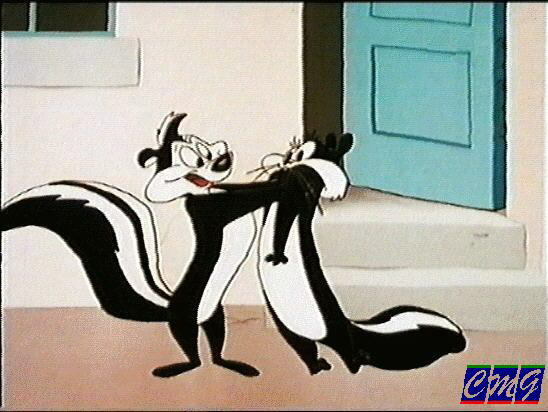 There the cat (named Fabrette) was born with a skunk-like appearance and at first falls for Pepe -- until she smells him. Pepe doesn't know why everyone says "Pew!" whenever he appears, and when he realizes why, he goes into a deodorizer's place to lose his scent. 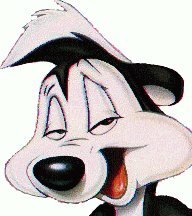 But Fabrette has entered a Limburger cheese place and comes out with a bad smell! 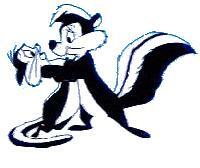 Pepe' s repelled by her smell and runs away! Pepe' s final appearance is in "Louvre Come Back to Me," where even inanimate portraits and sculptures in the Louvre museum react to his smell! "Where are you pigeon? I am looking for you!" "The best things of life are worth waiting for!" "If you cannot beat them...join them!" "Ah, my little darling! It is love at first site, is it not? Non! Mouch Mouch Mouch!"